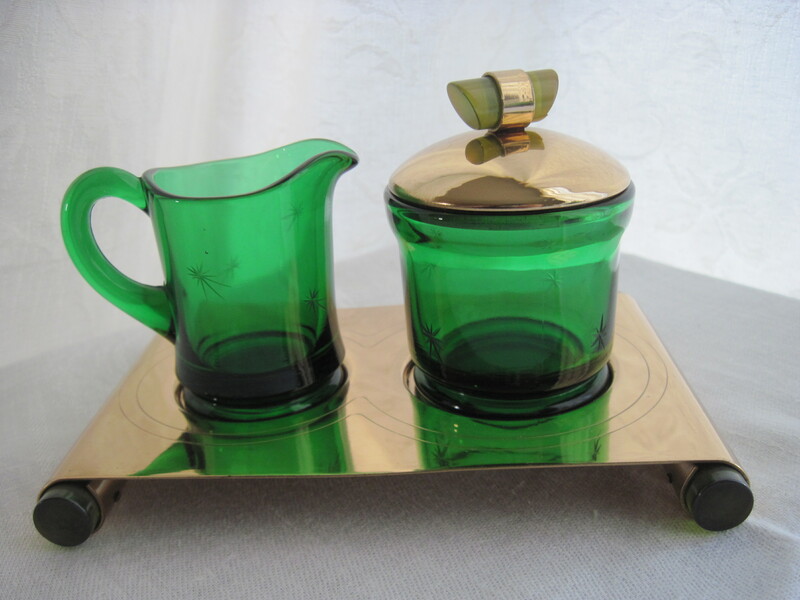 Emerald Glo was made by Paden City Glass Company for Rubel in the 1940’s and 50’s. The pattern was also made by Fenton in the later years of production but Fenton did not have the ‘star cut’ on it’s glass pieces. All pieces with the ‘star cut’ on the glass were made by Paden City. The pieces above all have the star cut on the glass. 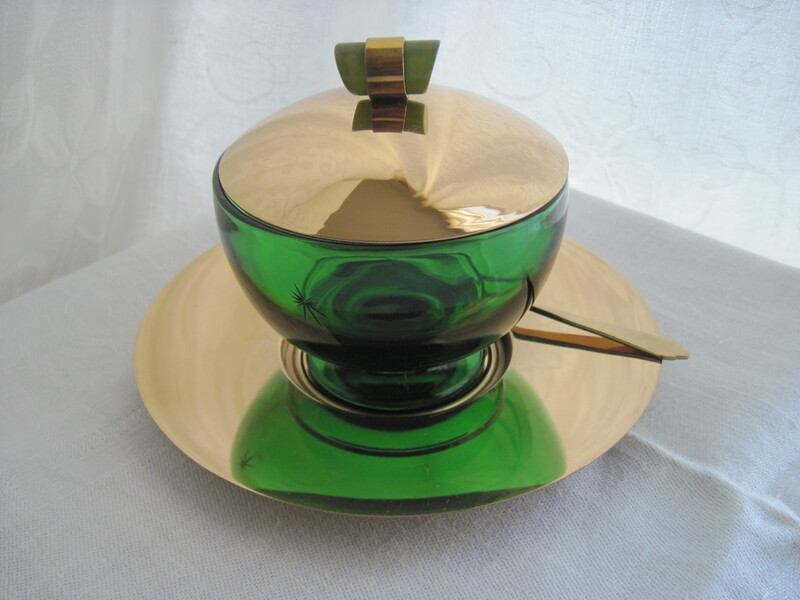 All lids have green Bakelite handles. 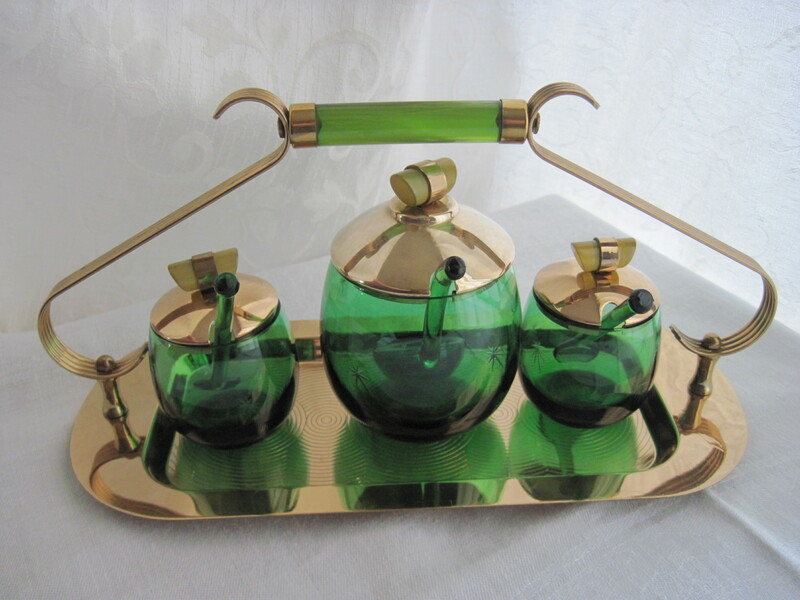 The trio is a condiment set, the lidded bowl is a Marmalade dish, and the 2 on the tray are cream and sugar. I don’t know who made this bowl but it is stunning. The soft pale blue colour almost shimmers in the light. It is made of thick glass and is quite heavy but appears light because of the colour. For sale at my booth in Almonte ON, at the Almonte Antique Market for $45.00. 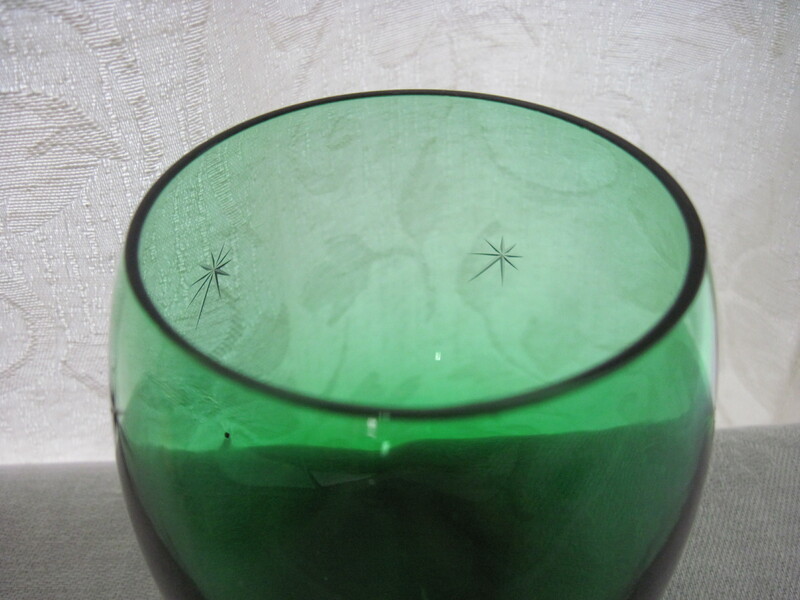 This pattern is called Saguenay and was made by Dominion Glass Co. of Canada, based in Montreal QC, with factories in Nova Scotia, and Ontario (Wallaceburg) . 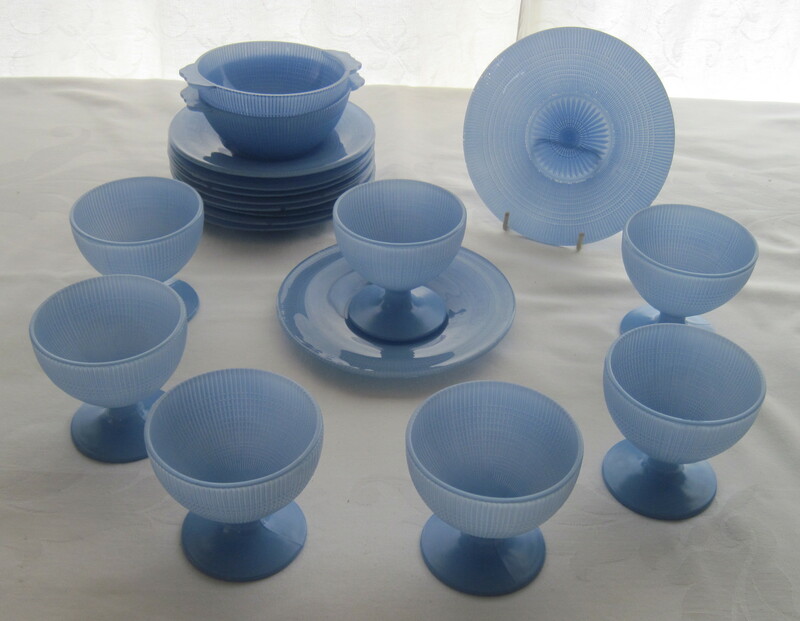 This was Canada’s answer to the coloured depression glass that was being made in the US during the 30’s. 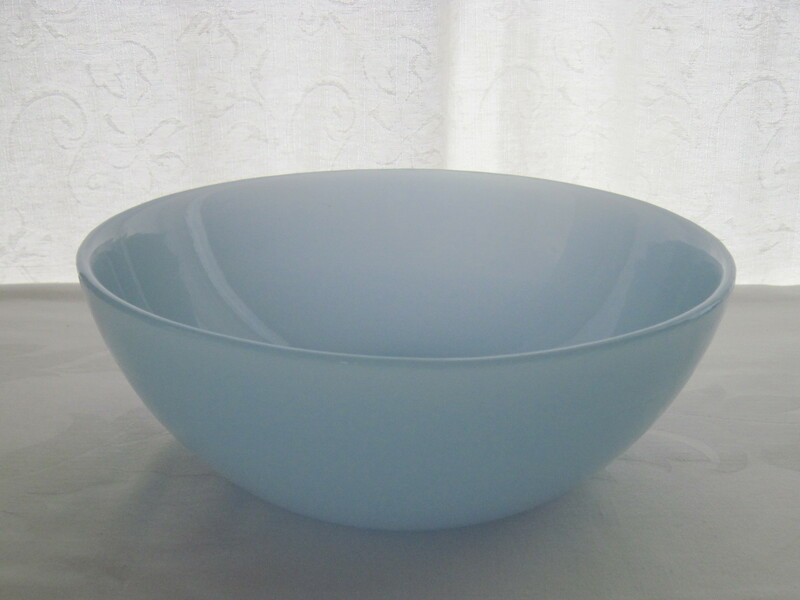 The beautiful blue colour is fired on the outside over clear glass. Hard to tell from my photo, but the pattern has fine ridges all around the pieces. 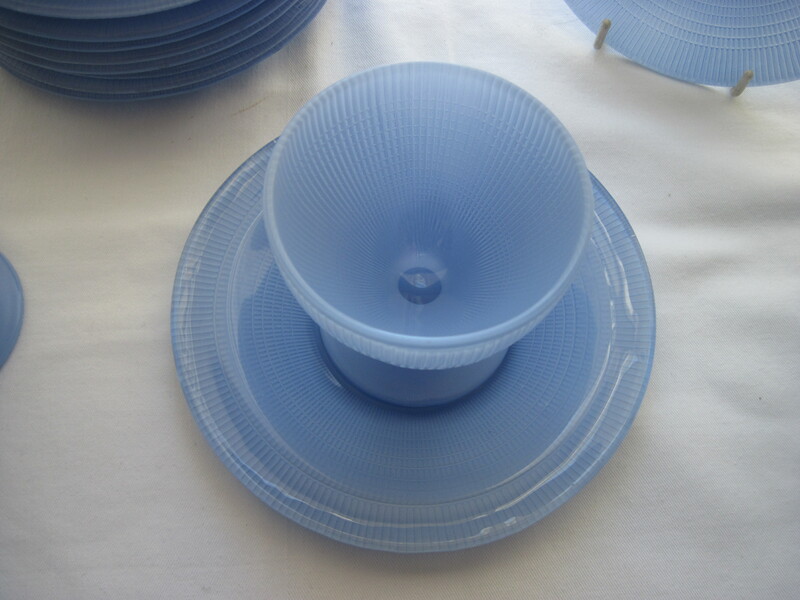 There are only two verifiable patterns of Canadian depression glass. This one and one called Swirl, also made by Dominion Glass, which was only made in clear glass. Saguenay came in yellow, pink, mint green, blue and clear. For sale at my booth in Almonte ON at the Almonte Antique Market. NOTE: All above dishes are now SOLD!!! Recent finds at an auction house. There are 3 sets of Delft Blue Shakers at the back left and two Delft Blue mini liquor bottles at the back right in the photo, made by Bols Distilleries for KLM Airlines, Holland, for their business class passengers. One is sealed and one is not. They are very collectible today. The small shakers in the middle are by Rosenthal in Germany. 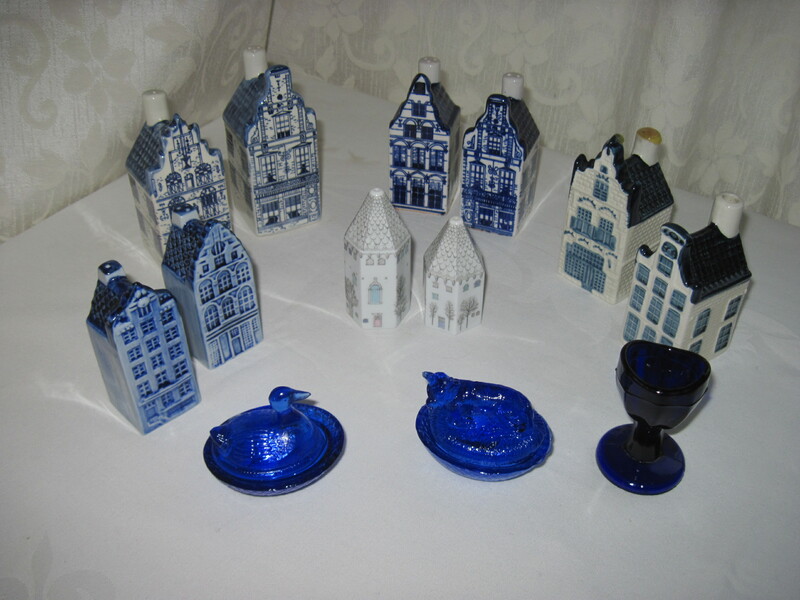 In front are two tiny cobalt blue covered dishes with a duck and a bull for lids. 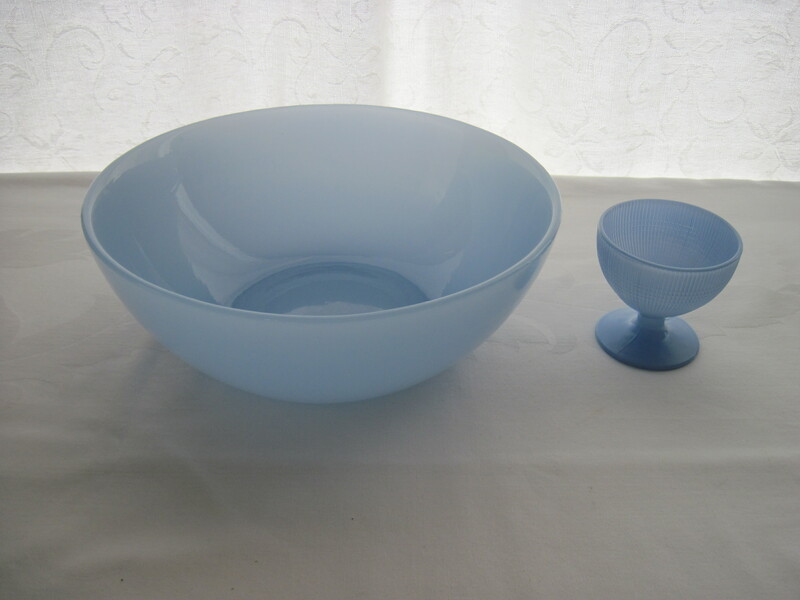 The darker cobalt blue glass on the right is an eye wash cup. Please note all the above items are now SOLD!! In the above photos one item is a reproduction. Can you spot it? It is the pitcher. This pitcher was never made by Hazel Atlas in this colour and you can tell when they are grouped together that the pink is more orangy than the other pink pieces which are genuine. Most likely the pitcher was made in the 1990’s by an offshore company trying to cash in on the collectibility of depression glassware. The 10″ berry bowl is by Hazel Atlas and the pattern is Royal Lace ca. 1930’s. The sandwich plate is Cherry Blossom by Jeannette Glass Co. ca. 1930’s. The cookie jar is by Federal Glass Co. ca 1930’s and the pattern is Mayfair Open Rose. The pattern on the repro pitcher is called Florentine 2. I found the sandwich plate and the berry bowl yesterday while out and about. Both were in perfect condition with no chips or wear around the edges. Manufactured by Jeannette Glass Co. during the depression, this is a lovely example of the Iris & Herringbone pattern on a 9″ high milk glass vase, flashed in a jade colour on the outside. This was rescued from a dump in an area where there are a lot of cottagers. Fortunately a good friend of mine who lived in the area spotted it and knew that I would appreciate having it. They are typically found in iridescent, clear or white milk glass and sometimes found in amberina as well. Pink ones are rare but do exist.